Title page. Rienzi, Louise. General instructions for rearing silkworms. 1887. Contributed in BHL from the Library of Congress. “Fifth stage of silkworms”. Rienzi, Louise. General instructions for rearing silkworms. 1887. Contributed in BHL from the Library of Congress. General Instructions for Rearing Silkworms is a straightforward and detailed guide to the practicalities of raising silkworms. Instructions for successful cocooneries include descriptions of the types of trays, rack, and shelves needed, methods for keeping the air pure and clean, and instructions for feeding the worms. There is also a lengthy section titled Treatise on the Selection of Healthy Silkworm Eggs, which gives instructions for microscopic examination of the eggs and blood of the chrysalis. 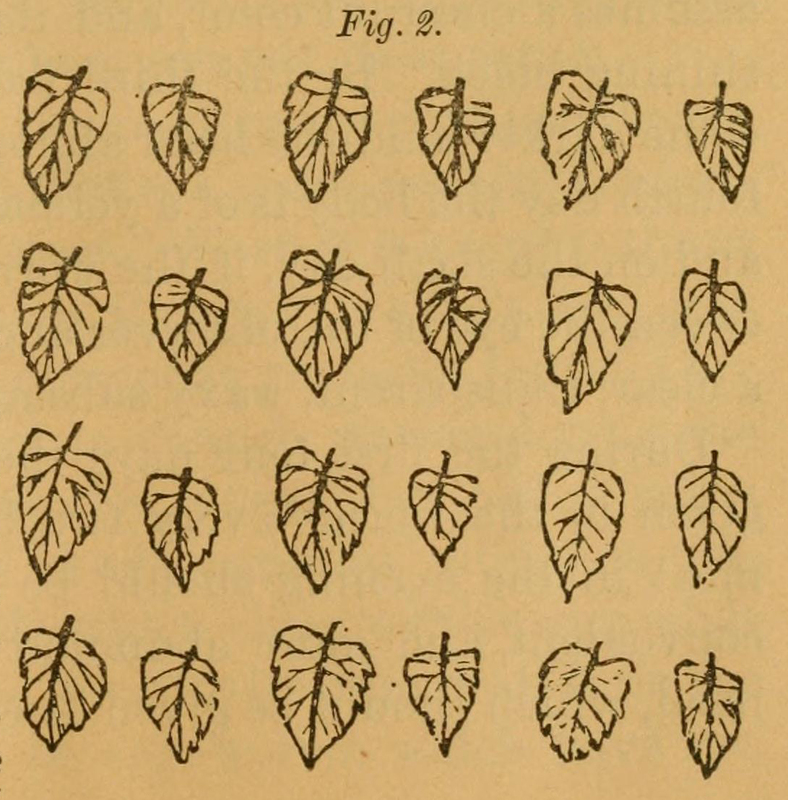 The entire manual is illustrated with numerous sketches of the equipment needed and the various stages of the eggs, worms, and moths themselves. Raising silkworms according to this manual is very much a labor-intensive undertaking. To start, a constant supply of fresh mulberry leaves must be available to the silkworm rearer. 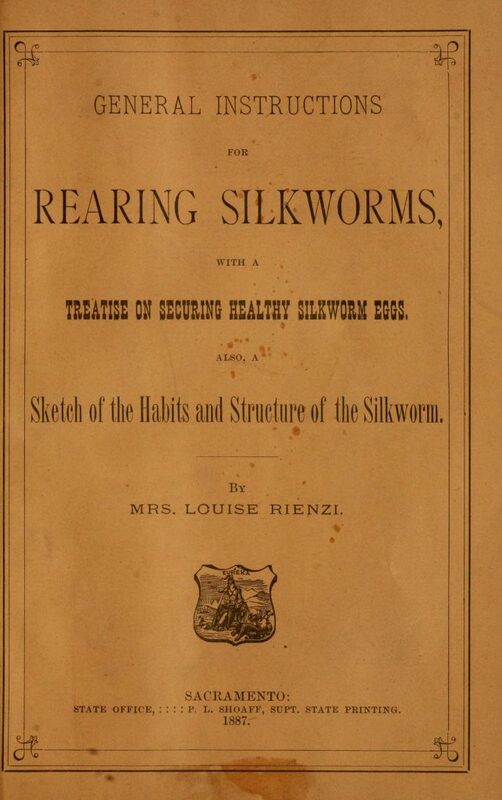 Rienzi states that “the worms from an ounce of eggs will consume from twelve hundred to thirteen hundred pounds of mulberry leaves.” At first, the worms must be fed every few hours with fresh leaves. The worms go through four moultings, each lasting about a week, and throughout this time period, the temperature, cleanliness and general welfare of the silkworms must be closely monitored. Mulberry leaves. Rienzi, Louise. 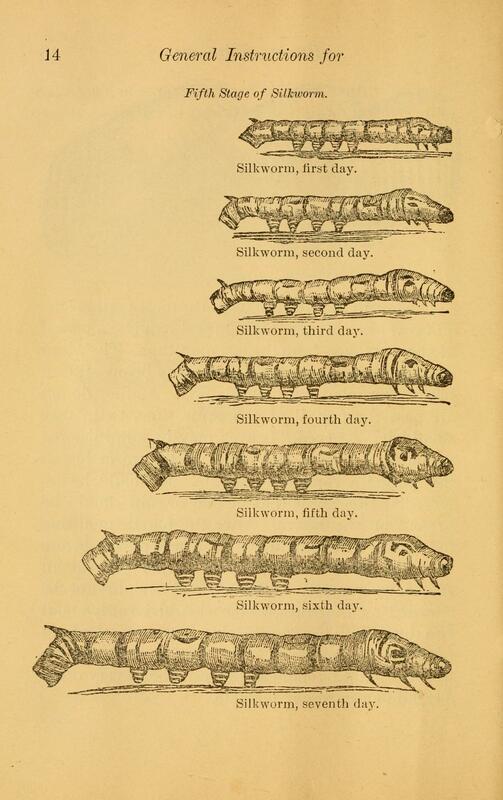 General instructions for rearing silkworms. 1887. Contributed in BHL from the Library of Congress. Despite her detailed knowledge of silkworm rearing and enthusiastic support of the California silk industry, the value of Rienzi’s work seems to have been overlooked for some time. It was not until 1895 that the California legislature voted to appropriate funds for the pay claim of Louise Rienzi “for services rendered the State Board of Silk Culture as Secretary, Instructress, and Silk Expert, from December 12, 1885- to April 2, 1887”. Her compensation was set at $87.50 per month. Klose, Nelson. Sericulture in the United States. Agriculture History, Vol. 37, No. 4 (Oct. 1963), 225-234. 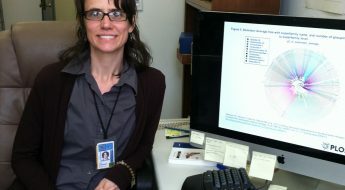 Alison Kelly is a Science Research Librarian in the Science, Technology & Business Division at the Library of Congress. 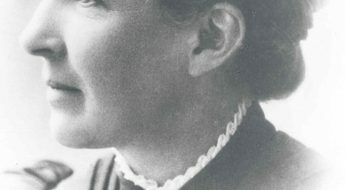 Prior to her current position, she was an archivist in the Shenandoah National Park Collections. Her primary subject areas of responsibility at the Library of Congress are agriculture and food history, plant science and horticulture. Tomoko Steen is the ST&B Research Specialist at the Library of Congress. 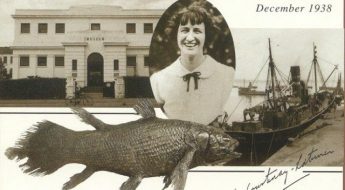 She is also the Library of Congress Member Representative to BHL.